By Admin on 23 February 2011 . 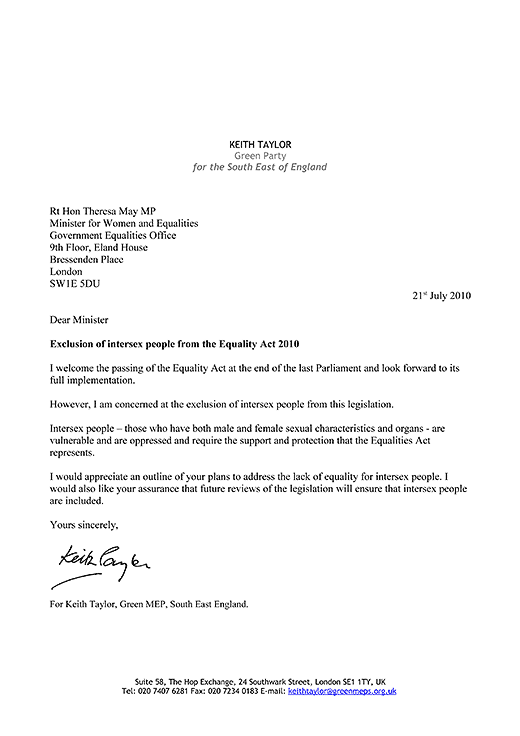 KEITH Taylor MEP – Member of the Parliament of Europe – for the South East Region has published a letter of enquiry and its reply as record of his correspondence with British Home Secretary Theresa May and Parliamentary Under-Secretary for Equalities Lynne Featherstone. The subject is the non-inclusion of intersex people from the United Kingdom’s equality and human rights law reform efforts. AS the only current ILGA-affiliated intersex organization with full financial membership it is incumbent upon OII Australia to pay keen attention to global happenings relevant to intersex. A decision on our December 2010 motion that ILGA institutes an Intersex Secretariat on a par with its Trans and Women’s Secretariats to specially pursue intersex equality and human rights worldwide was postponed, not refused altogether. We remain convinced, based on the evidence, that intersex people can only achieve full equality with other human beings via a global campaign with local and regional variations. 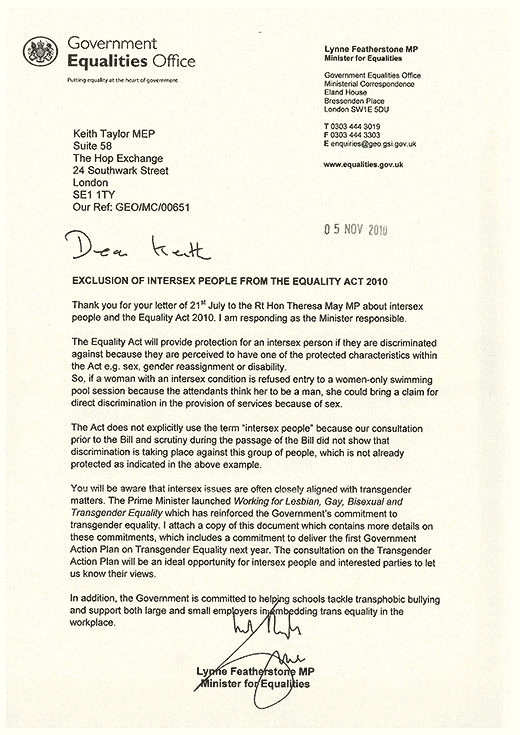 We were intrigued and impressed to come across Keith Taylor MEP’s letter to Theresa May last year, attesting to his interest in the fate of intersex Britons.